The festive season was celebrated by Tata Motors by delivering as many as 1100 cars to the company’s customers on the auspicious celebration of Ganesh Chaturthi. These sales occurred in Gujarat, Chhattisgarh, Madhya Pradesh and Maharashtra as a way to mark the occasion. The company had noted a rise in demand in these regions on the eve of festivities with Maharashtra alone taking as many as 700 of the deliveries. In order to latch on to this, Tata is also offering various “exciting” packages for the festive season and has also worked on aligning deliveries that can meet customer demands. According to Tata, the festive season is a culmination of excitement, enthusiasm, energy and anticipation. The start of this festival marks the impact Tata has had and the brand is quite proud of the trust and support that it has managed to build. With the Bolt, Zest as well as the next gen Nano, Tata has been quite successful in bringing the happiness of mobility to Indian customers. Tata Motors has also been quite visible at the NADA Auto Show in Kathmandu. Apart from the Bolt, eXeta and the Zest, the carmaker has also released the new Strome in the country which has been priced between NPR 42.25 lakh and 56.85 lakh. Tata also organized an interactive area at the event to help customers make more informed decisions and this included three sections- music booth, gaming zone and customer interaction section as well. 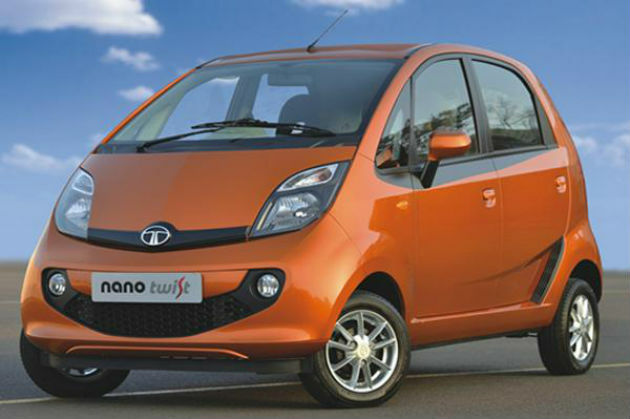 Despite not so happening sales at the bay, Tata Motors is reported of brewing more trim of Nano for the Indian market. This upcoming bee will attract low-cost buyers of Nano Twist and will sit lower than the Nano CX. After this new launch during the month, Nano LX will be discontinued and Twist XT will be retained. Hence, due to this move, it replicates that all trims of Nano Twist will possess the power-steering – the base trim XE and the top-end Twist XT. For the sake of power steering buyers will have to miss out other bells and whistles. To name some of them, bumpers will be painted black, no wheel caps to be provided and many more. Along with the cherishing new power steering, it will also deliver that new instrument cluster shows trip meter, fuel-economy, distance to empty and digital clock. The remaining features are bound to be carried over from current Nano CX trim. Tata Nano – the world’s cheapest car, is on the extreme verge of transformation of image to a smart city car. 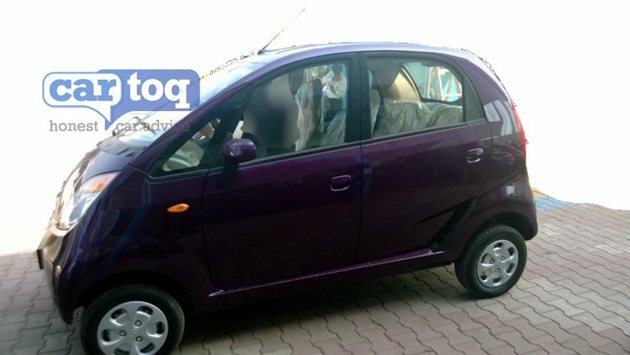 In an effort to make the Nano package more desirable, Tata Motors is reported to be working on a more powerful engine version that will be supercharged – designated for the drive-enthusiasts, and more probably the youths. It will be the first time the Nano’s engine will be tweaked. The second big thing that Nano is going to see is the AMT (automatic) gearbox, which we are already informed at the Delhi Auto Expo 2014. 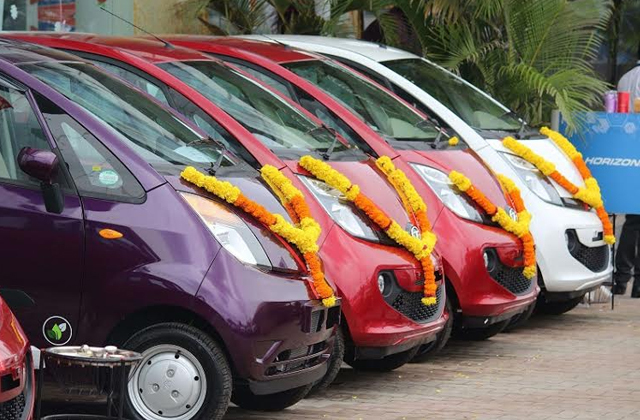 The third major invention on the Nano’s platform is said to be the part-Electric variant, to be uttered as ‘e-rev’. This part-EV will cater to the Indian audience as well as international. Though very sketchy images are only available about the aforesaid variants, but still it can be reported the company is quite serious about the Nano project. Hopefully, with all the three variants in the developments Tata Motors will surely fill in the remaining gap of product line, but what kept us pondering over is “diesel variant”. We can take, the oil burner variant of Nano is seemed to have taken a backseat in the R&D. What say? Tata Nano going more friendly with the city-drive, after Nano Twist there is a rumour rendering in industry of more city-friendly ‘Nano automatic’ to be launched in India soon. However, there is no such evidence of the said car to be surfacing nearby. But the various reports on internet are claiming this aggression fruitfully. 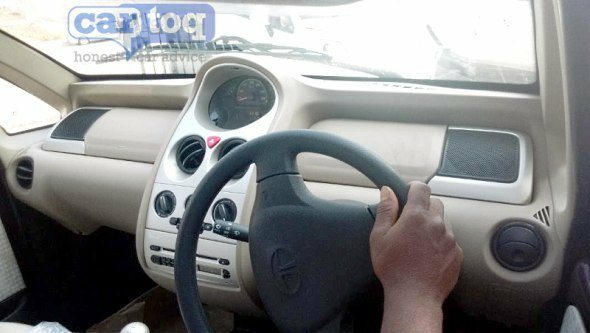 In fact, the power steering was enough to crank up the world’s cheapest car for an urban friendly drive. The Nano automatic may become the world’s cheapest automatic car if launched. Hence, Nano Twist dons a dual-tone interior, driver information system, 4 meter turning radius, powerful music system with Bluetooth connectivity, keyless entry, and ultimately what everyone was waiting for the ‘power steering’. Powering to the Nano comes from a 624cc 2-cylinder MPFI petrol engine producing 38PS and 51Nm of torque, with a fuel-economy of 25kmpl. The latest paint shades which are added to the list for Nano Twist are Damson Purple, Dazzle Blue, Royal Gold, alongside the existing Papaya Orange, Pearl White and Meteor Silver. Pricing for Tata Nano Twist starts at Rs. 2.36 lakh ex-showroom Delhi with customization available for additional cost. 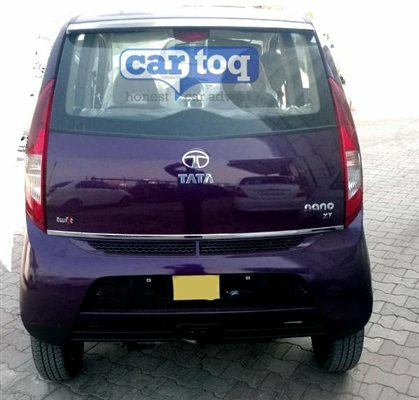 Tata Nano is brushing up hard to land on the spot in terms of sales numbers, and to its outcome the Tata Motors has came up with a power steering version of it called “Nano Twist”. It is been tagged under the hat of edition “XT”. And is priced at Rs. 2.36 lakh ex-showroom Delhi, which is just Rs. 14,000 more than the outgoing version. Hope so to call it a delight, Nano Twist not only boasts power steering for the new tag, but it also held a powerful AC, Remote Keyless entry, dual tone spacious interiors and new music system with Bluetooth connectivity. The toping of the new Nano package is done with the Damson Purple paint shade which concludes the total paint shade available to six, namely, Damson Purple, Dazzle Blue, Papaya Orange, Pearl White, Meteor Silver and Royal Gold. Inclusive in the new, driver assist system, 4 meter turning radius, 180mm of ground clearance, ‘active return’ convention to the electronically assisted power steering wheel adds exclamation to the Twist. We bet the 624cc 2-cylinder MPFI petrol engine does its job blissfully for the 38PS goodness and the 51NM of torque. In fact this much oif change, Nano is still said to deliver 25kmpl of fuel-efficiency. Tata has been working on the power steering variant of the Nano, which has now been spotted and is called the Nano Twist. The car is expected to be launched at the National Centre of Performing Arts, on 13th January that will be held in Mumbai. ZF Friedrischshafen has supplied this new electric power steering for the Nano. This system has been specially developed for the Nano, and will feature “Active Return” along with a brushless motor. Most of the other cars that are now manufactured feature the electric power steering. This feature has been added to the Nano so that it is easy to navigate the car in the city traffic. The new Nano does not seem to have too many changes with respect to its previous models. The car will only feature new badging and will be offered to the customers with an additional color option of Damson Purple. 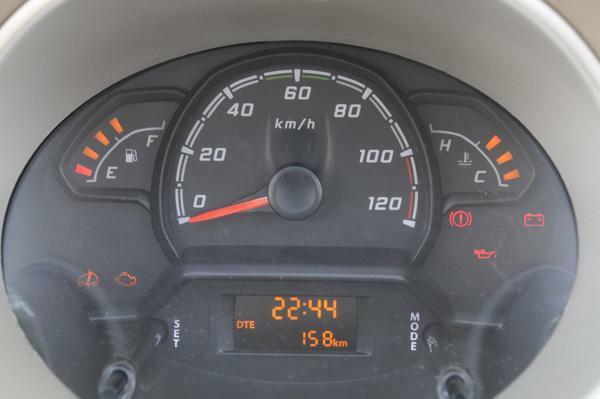 The instrument panel has now been redesigned, which comprises of LED fuel and temperature gauges. The digital clock and the digital trip meter have been repositioned, along with the new power steering system interface. Just like the previous models of the car, Nano Twist will feature the same 623cc, two-pot engine which can produce maximum power of up to 37bhp with a maximum torque of 51Nm. 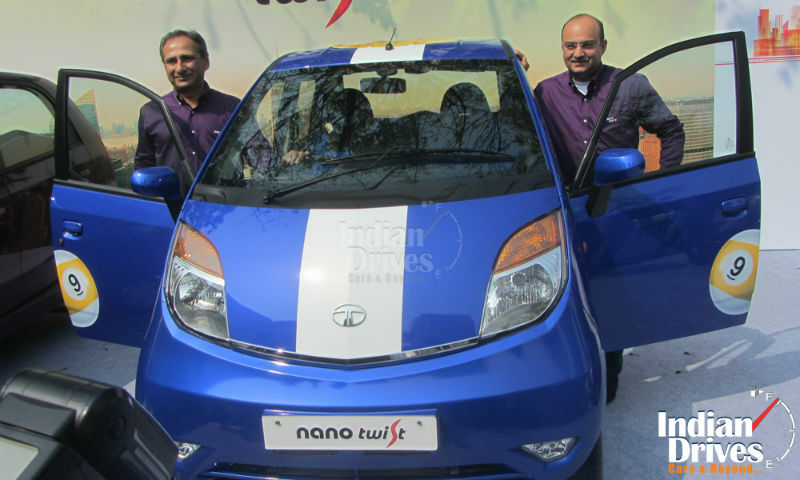 Many of the reports have pointed out that Tata has already dispatched the Nano Twist to many of its dealers. The car is expected to have two variants, the XT and XC, which will have a price of Rs.15,000 more than the LX and CX variants. Tata Motors today announces that the Tata Nano has been crowned as the Most Trusted Brand in The Brand Trust Report, India Study – 2013. Trust Research Advisory (TRA), India’s foremost research agency on Trust has released The Brand Trust Report, India Study – 2013. The Brand Trust Report – India Study 2013 lists 1,100 Most Trusted Brands from 211 categories from among the 19,000 unique brands generated in the study. 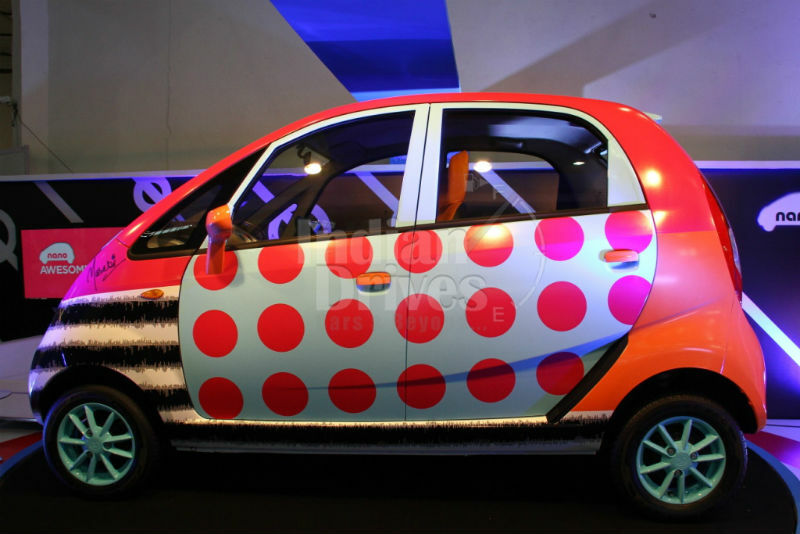 After a quick makeover this year, Tata Nano is all set to appeal the youngsters. Backed by a powerful communication strategy, brand Nano showcased its glory in the recent Brand Trust Report, India Study, 2013. The report has recognized Tata Nano as India’s Most Attractive Brand and Most Trusted Brand in the Hatchback category. The Brand Trust Report, India Study is an annual study based on a primary research conducted across Indian cities based on Trust Research Advisory’s proprietary 61-attribute Trust Matrix, and research associations with the Indian Statistical Institute. It is a comprehensive report on the most trusted brands and has 3 million data points, targeting more than 2505 consumer influencers, based on the primary syndicated data, collected from 16 cities, across India. The research studies trust attitudes and preferences of brand influencers and also lists the Most Trusted Brands in India based on the Brand Trust Index. Some days back we reported about Tata Motors unveiling the Masaba Gupta designed Nano at Wills India Fashion Week in New Delhi. Hence, now the same has happened yesterday and we are given the Press Release of same, where one can see how the young and peppy designer has given her unique shades to the car. Mr. Ankush Arora, – Sr. Vice President, Passenger Vehicle Business Unit (Commercial), Tata Motors was also present there at the venue, along with Masaba Gupta. Formally, the most promising designer of the year, Masaba Gupta, is known for her quirky yet chic pop prints that stand out from the crowd. And yesterday she enthralled fashion aficionados with her designer Nano as fashion met marvelous engineering at the Nano Awesomeness Live. The new ad campaign celebrates the awesome spirit of young achievers, who live life on their own terms. The TVC campaign has been extended to ‘Nano Awesomeness Live‘ which will give the youth an opportunity to learn from young achievers real time. Awesomeness is a strongly brewed tag of Tata Motors, and while making it more playful, the Indian carmaker seems not losing a single cashing opportunity. 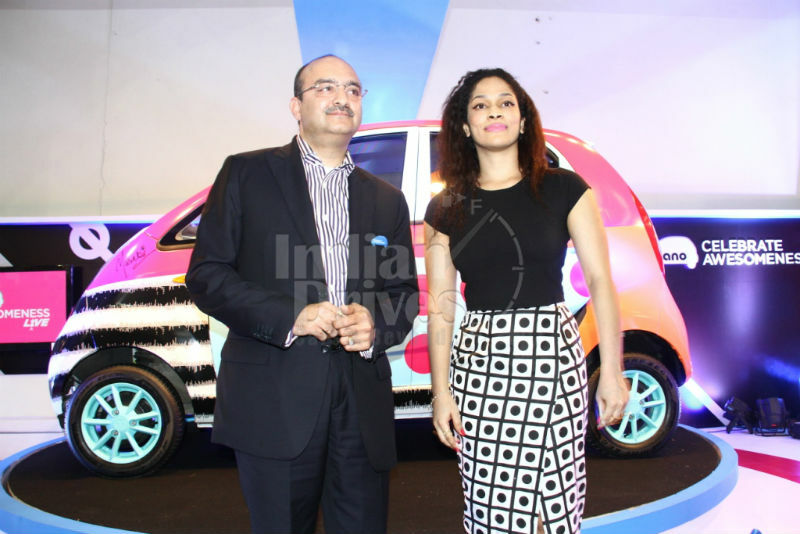 To name a one, the very talented, prodigal fashion designer Masaba Gupta is said to unveil her version of the Tata Nano, in her quirky, signature style on October 9, 2013, at the Tata Nano Lounge of the Wills India Fashion Week, which will be held at the Pragati Maidan, New Delhi. 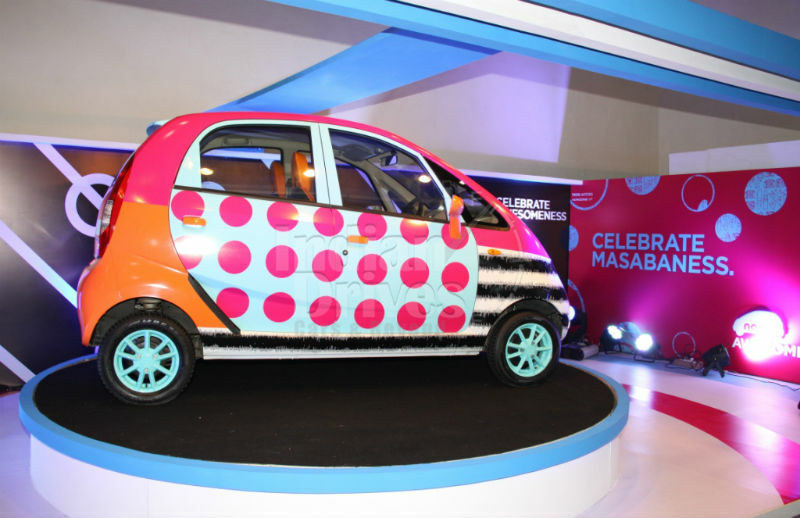 Masaba has associated with the Nano a long way back. Earlier, she was seen in the exciting new Tata Nano TVC which kick-started the Awesomeness campaign, celebrating the spirit of being a young achiever. To an addition, Tata Motors feels, Nano is the India’s most innovative car and has always believed in reinventing the norms. For redefining itself, its all-new edition has brought to life a new world of awesomeness. 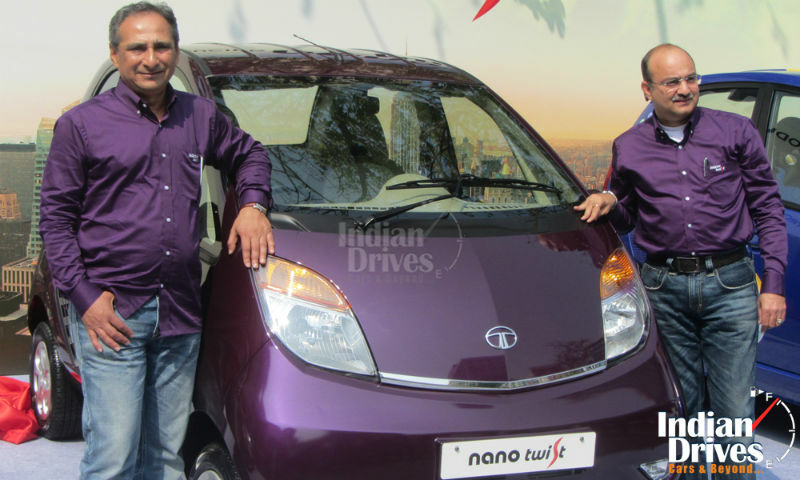 Tata Nano Going to be Sold Online? 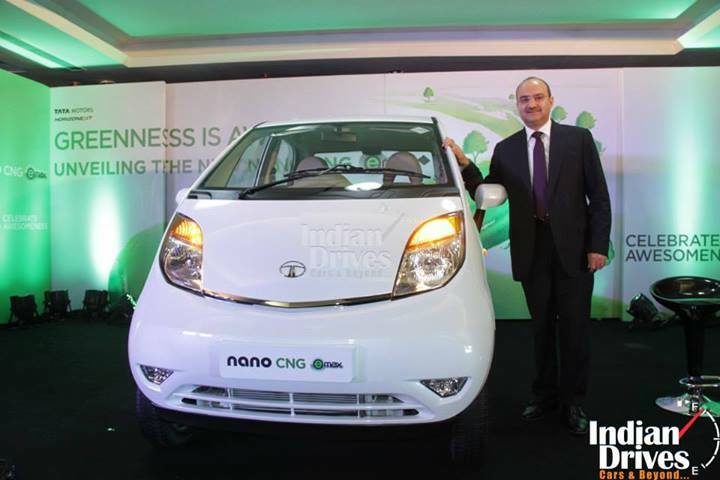 Nano was made with a vision to bright the future of Tata Motors. Political issues ruled out the planning of manufacturing bay during the initial stage and also the heavily surged steel price made the engineers at Indian carmaker’s end to go back to the design board and redesign the product. Then Nano was in trouble to suit the respective price band of Rs. 1 lakh, yet masters however completed the job in right time. 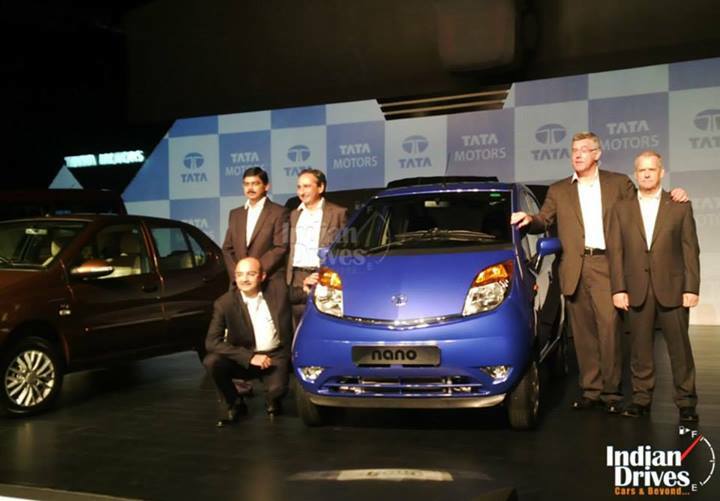 But not to deny the fact, Tata made a ‘cold-blooded’ launch with the first generation of Nano due to such causes, at later stage it rolled out the new Nano (in a new avatar) which fared well against the previous one. Again to bring in more of the numbers on the paddock of world’s cheapest car, Tata is working out a new strategy in the sales-technique of Nano ‘facelift’. And as stated by Business Standard the carmaker is working to sell Nano directly through the internet itself. Yes, the automaker had recently launched the new sorts of services (under ‘Horizonext’) across its whole passenger vehicle range, in which it had successfully sold some of the units directly on the internet, and vying to start the fully fledged sales very soon. Under the hat of technology as slated, if the customers who are not able to pay the entire amount of car at the time of booking then they can make partial payment as the booking amount, while remaining sum has to be cleared when the car is delivered at their doorstep via nearest Tata dealership. Hope so, it may help to garner the sales of Nano facelift very easily, and it can reach the customers who are busy a lot, even some who had internet connection but not a Tata dealership for booking Nano on his daily routine to office/schedule! Lastly, the major benefit that is going to be derived from this initiative is for the customers. They will be barred from paying the additional amount to dealers which they end up in making huge sum of the cost.